During the British Period in Florida the New Smyrnea settlement (1768-1777) was part of the British effort to populate East Florida. The settlement pattern of modern New Smyrna Beach overlaps that of eighteenth-century New Smyrnea creating a complex setting for historical and archaeological research. This paper reviews the efforts of local citizen volunteers, historians, archaeologists, and civic officials to recover part of their city’s heritage through archaeology and historical research. City, county, state, national, and international levels have been involved. Some sites have been excavated, others have been lost, and some have been preserved during the past decade and the future will bring many more challenges. Eighteenth-century New Smyrnea settlement is largely invisible because it lies beneath the modern city of New Smyrna Beach, Florida and most residents are unaware of the original British colony. During the past several years substantial parts of the original settlement have been the subject of archaeological research. Throughout this time a few professional archaeologists have been assisted by an army of local volunteers whose hard work has been vital to saving the remains of the settlement. Their contributions are a major aspect of this paper. The British acquired Florida from Spain in 1763 and New Smyrnea settlement was the largest of the plantations established during the British effort to populate the Province of East Florida (Schafer, 2001). Andrew Turnbull, a Scottish physician, was the on-site manager. His partners were Sir William Duncan, physician to King George III, and Sir William Temple (acting for Lord George Grenville). New Smyrnea settlement encompassed 40,000 of more than 100,000 acres granted to the partners. Turnbull had supervisors, slaves, and white workers preparing for 500 settlers while he went to the Mediterranean where he recruited 1403 Minorcans, Greeks, Italians, and others as indentured settlers. He arrived at Smyrnea with 1255 survivors in 1768 (Griffin, 1991:28). New Smyrnea was named for Mrs. Turnbull’s hometown, Smyrna, Greece, which is now Ismir, Turkey. The full story of the settlement is complex. Forty-five percent of the settlers died during the first two years in Florida (Griffin, 1991:38). A sudden, violent three-day wind and rain storm “... uncovered some part of most of the Houses and Hutts [sic] ...” a month after the settlers arrived (Turnbull to Duncan, 22 October 1768; Grange and Moore, 2005). A mutiny was put down by British troops (Griffin, 1991:33-35). Early indigo crops were good but declined due to soil exhaustion and drought (Griffin, 1991:86). Turnbull’s financial partners were anxious for profits but grew tired of the high cost of maintaining the settlement. The settlers were poorly fed and clothed and complained of harsh treatment. In 1775 Turnbull wrote that if Sir William did not pay the bills “... I will be forced to release our people from all work to forage for their sustenance ...” and that “... they see all the Negroes in the province better supplied with cloathing [sic] than they are” (Turnbull to Duncan, 20 February 1775). The American revolution brought new pressures and Turnbull lost status in a political intrigue (Schafer, 2001:149-151). The settlement collapsed in 1777 when Governor Tonyn released the settlers from their indentures and they fled to St. Augustine where their descendants still live (Griffin, 1991:99). Murphy’s Law says it well: everything that could go wrong, did! A small but unknown number of settlers stayed at the settlement for an unknown period of time. During Florida’s Second Spanish Period (1784-1821), new land grants brought new settlers to the area. One Turnbull relative and a few Minorcan descendants live in New Smyrna and Edgewater and some are museum volunteers. This paper is not about the settlement, however; it is about how local people participated in archaeology to explore this part of the brief British period. 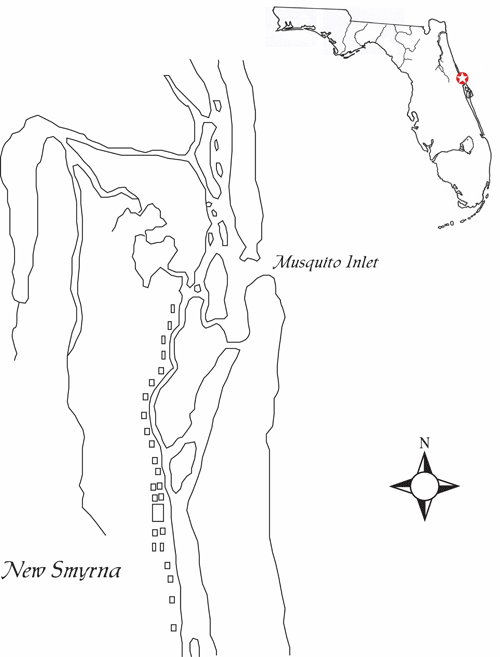 The settlement pattern of modern New Smyrna Beach overlies that of eighteenth-century New Smyrnea and prehistoric occupations along the banks of the Indian River (Austin et al., 1999). New Smyrnea’s town center, industrial sites, and workers’ houses stretched for almost eight miles along the west bank of the modern Indian River (Figure 1). 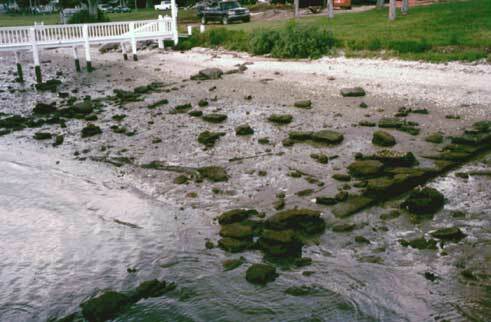 The most visible colonial features are the stone wharf (Figure 2), part of the canal system, and an undated coquina stone foundation in Old Fort Park. Fig. 1: Tracing of eighteenth-century map showing the linear arrangement of structures at the New Smyrnea settlement (Original: Public Records Office T77/21/137). A Turnbull descendant (Doggett, 1919), historians, and anthropologists have explored the historical record (Griffin, 1991; Panagopoulos, 1978; Rasico, 1990; Schafer, 2001), but archaeological work was limited. Surveys of the canal system and the King’s Road were done in the 1990’s (Griffin and Steinbach 1990; Adams et al. 1997). A local museum displayed a few artifacts found by local collectors, but those individuals never revealed or even recorded the locations of their site-damaging activities, effectively consigning the remaining evidence of the eighteenth-century colony of New Smyrna Beach to the realm of mystery. Intensive archaeological research in the settlement habitation area was begun by avocational archaeologist Dorothy (Dot) Moore. She collected copies of relevant historical maps and documents during years of searching for Turnbull settlement remains. Moore found the First Colonists’ House site on property the City of New Smyrna Beach had sold to an automobile dealership despite her warning that it might be historically significant. Moore’s interest in archaeology was sparked by finding a projectile point in childhood and reading. In 1982 she was a participant in a salvage excavation at a prehistoric mound. She followed this with a field archaeology training course at Daytona Beach Junior College. Subsequently she has worked as a volunteer or paid assistant with numerous archaeologists in Florida and South Carolina. She has been an active officer and director of the Florida Anthropological Society. Much of the archaeology accomplished in New Smyrna Beach would not have happened without her continuing efforts. Roger Grange retired from the University of South Florida in 1994 and moved to New Smyrna Beach for the surfing, but Moore recruited him and self-funded volunteer excavations at the First Colonists’ House site began (Grange, 1999). Progress was slow with only two or three workers until Dana Ste. Claire, Curator of Archaeology at the Daytona Beach Museum of Arts and Sciences, arranged to operate youth and adult archaeology field schools at the site. The property owner, Dennis Higginbotham, allowed work to continue for a year and volunteer efforts, totaling five thousand person-hours, recovered substantial data from the site. The goal was to obtain as much archaeological data as possible before development, leaving analysis and complete reporting for the future. All excavated soil was screened via 1/4” or 1/8” mesh but unfortunately water screening was beyond possibility in the uncertain time available. All excavations at this and subsequent sites were carried out within a metric grid or defined features by hand troweling with stratigraphic deposits as the vertical control. We chose data quality over the amount of dirt moved and this proved to be essential at sites occupied from prehistoric times to the twenty-first century. Nails were the most common artifact recovered from structures and the chronology of wire, machine cut, and wrought nails proved to be a critically significant key to dating features and strata. Volunteers were trained on-site by Grange and Moore and became adept at working through piles of rubble in search of architectural evidence. Two buildings were excavated. One was a six-meter-square coquina structure which contained a few domestic artifacts but its function remains undetermined. A small oven and part of a midden were also excavated. The main feature at the site was a lath-and-plaster house (Figures 3 and 4). Standing wall remnants and a double central fireplace defined two rooms. Unfortunately, most of the floor had been turned over or holed by artifact collectors. Half of an interior wall had been destroyed making it impossible to determine whether it was one house with two rooms or two single-room units in one building. Documents discovered several years later revealed that two families were housed in each farm house. Excavation by Holly Henderson and other volunteers revealed the lath-and-plaster construction system of interior and exterior walls. Fig. 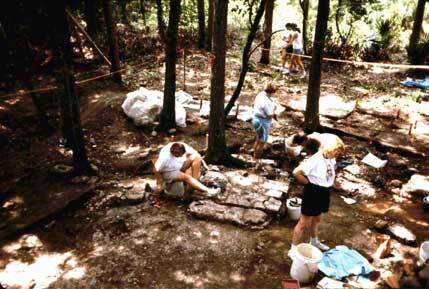 3: Volunteers excavating the First Colonists' House. Fig. 4: Charred post and lath with associated wall fragments. Our volunteers had many skills and one created a scale model of the excavated building which is now on display in the New Smyrna Museum of History. Wrought nails were abundant but other artifacts were scarce. Too few specimens were found in or on the disturbed remnants of the house floor to reconstruct household activities. However, everywhere the British went, their pots were sure to go, and ceramics provide an archaeological date bracket of 1762-1779, reasonably close to the 1766-1777 historical dates of the settlement. Except for a small religious medal, no definitively Greek or Minorcan artifacts were found, reflecting the settlers’ total dependence on their British masters. If any such personal mementoes had been present, they may have been taken to St. Augustine when the settlement was abandoned. We kept reporters and photographers from the New Smyrna and Daytona Beach newspapers informed about progress or new discoveries, held public visit days, and presented talks about the work. When field work had to end, the City of New Smyrna Beach paid to entomb the house floor under a theoretically removable concrete cover, and now vehicles for sale are parked on the site. We kept our colleagues up to date by presentations at meetings and through journal articles (Grange, 1997; 1998; 1999; Moore and Ste. Claire, 1999). Public interest led the cities of Port Orange and New Smyrna Beach and the County of Volusia to obtain a State of Florida grant for an extensive survey in 1998 (Austin et al., 1999). The field work was done by Southeastern Archaeological Research, Inc. and volunteers participated in the effort (Figure 5). Thirty new colonial sites were recorded although most had been damaged by modern streets and houses. This survey contributed to the general goal of finding out how much remained of the eighteenth-century settlement so that further research could be conducted and preservation plans developed. Volunteers, led by Moore and Grange, continue rescue excavations at sites impacted by new development. Fig. 5: Survey test excavation on private property. The City of Edgewater, which includes the southern end of the eighteenth-century settlement, joined the other sponsors in applying for and receiving a second state grant designed to extend the survey area, reevaluate known sites, and produce a thematic National Register of Historic Places nomination which put 14 colonial sites on the Register (Southeastern Archaeological Research, Inc., 2005). Most Turnbull settlement records are in the Public Records Office and other British archives. In the midst of preparing the National Register nomination, a new archival collection appeared. Colin Macintosh was working on a collection deposited by the Duncan family at the City Archives in Dundee, Scotland. Macintosh wondered if New Smyrnea still existed and eventually made contact with the Southeast Volusia Historical Society. The collection includes eighteenth-century maps and many of Turnbull’s letters to Sir William. When copies of the maps arrived at the museum, we had a public viewing and invited Dan Schafer, a University of North Florida historian specializing in the British period. Two days later Schafer was in Dundee and has always shared with us his notes, quotes, and ideas. The Dundee maps show the farmers’ houses aligned along the Indian River for seven miles, adjacent to the agricultural fields, or “in the country” to use Turnbull’s term. Near the wharf there was a central cluster of 31 buildings which Turnbull called the “Town” where clerks and specialists lived. Archaeological evidence shows that buildings in town were painted white on the exterior and red and yellow inside while the farmers’ houses were unpainted. Further analysis of intra-settlement variation awaits completion of our current efforts to process the artifacts and faunal remains from a decade of excavation. Several sites in the town area required rescue excavation as new construction took place. At one location, limited salvage excavation recorded the corner of a house and a bottle-laden pit before the lot was cleared for new construction. Dot Moore has filed 48 State of Florida site reports on these additional sites. The White-Fox site typifies the occupation sequence along the Indian River: The prehistoric occupation was mainly St. Johns-period (500 B.C.-A.D. 1500) middens which line the riverbank. During the 1770s a frame lath-and-plaster structure was built and Turnbull himself may have shared it with the clerks before his own house was built. A century later, Dr. Benjamin Fox built his house on the site. When it was demolished in 2001, the remains of the eighteenth-century building were exposed and excavated. Archaeology at White-Fox was done over a five-year period. It was slow going with only three volunteers who did not work every day and not all day when they did work. We did have numerous short-term helpers, however. In addition to the house, the base of a large oven was exposed and city workers moved it to become an outdoor exhibit at the New Smyrna Museum of History. The property owners, Doug and Vicki White, let us work until the property was sold and in 2009 the new owner built a large house covering most of the property. News reports and public visit days served to maintain local interest and we still distribute a free publication about Smyrnea settlement archaeology (Austin and Moore, 1999). The exhibition of copies of the Dundee maps sparked new enthusiasm for the volunteer-operated New Smyrna Museum of History and resulted in state grants for the enhancement of the exhibits (Figure 6). The new museum exhibits and a video, “Smyrnea Lost and Found,” (Sibley, 2006) both won top preservation awards from the Florida Trust for Historic Preservation. The video committee was chaired by Donnadine Miller. Archaeology month lectures help to keep interest alive. The museum cares for Volusia County archaeological collections with a small fund for curation, supplies, equipment, and, currently, faunal analysis. We continue to keep the professional community informed of our research efforts through presentations and journal articles (Grange, 2001; 2007; Grange et al., n.d.; Grange and Moore, 2002; 2005; 2006; 2007). Fig. 6: Examples of museum exhibits: left) Minorcan traditional dress; right) steelyard scale excavated from a Smyrnea indigo works with a modern scale and indigo-decorated cloth. New Smyrna Beach needed an ordinance to protect archaeological sites but appeals by archaeologists fell on deaf ears, partly due to credibility issues regarding volunteer work. There was a city commission agenda item to forbid public metal detection on city property. Faced with an audience of three archaeologists and 50 angry metal detector club members (mostly from out of town), the mayor dismissed the issue saying: “... this was just a squabble between two hobby groups.” In contrast, city planners Mark Rakowski and Chad Lingenfelder, and some other city officials, have always been supportive of archaeology in the city. City maintenance work and private development often damage historic and prehistoric sites. For years Dot Moore attended meetings of the New Smyrna Beach Historic Preservation Commission and spoke about impacts on prehistoric and historic-period archaeological sites, particularly in the city’s historic district. The Commission often required land owners to allow her to do test excavation, as a free-of-charge volunteer, to mitigate impacts. Grange had served on that commission but made no progress in efforts toincrease protection of archaeological resources. Fortunately, Donnadine Miller, one of our volunteers, became Chair of the city’s Preservation Commission and led a successful campaign for an ordinance requiring archaeological work on city property. Miller’s public service efforts were an expression of her desire to “make a difference” and she got interested in volunteering in archaeology when Dot Moore invited her to assist in the excavations at the White-Fox site. She was also helping Dot Moore in a GPS survey of the Turnbull canal system for a National Register nomination just before her death. Now city officials often consult with Grange and Moore about the potential archaeological impacts of city projects and we provide resources for their use (Grange and Moore, 2007). Several different cultural resource management firms have carried out required surveys and excavations. Moore is frequently a paid consultant working with CRM archaeological firms doing projects in the city, providing them with the benefit of her years of local experience. The archaeological survey reports by Southeastern Archaeological Research, Inc. consistently recommended sites for preservation but no immediate action was taken until 2008 when Volusia County purchased the entire Blanchette property just before it was sold for a housing development. The site includes one of Turnbull’s indigo production works shown on 1770 and 1771 maps and is listed on the National Register of Historic Places. 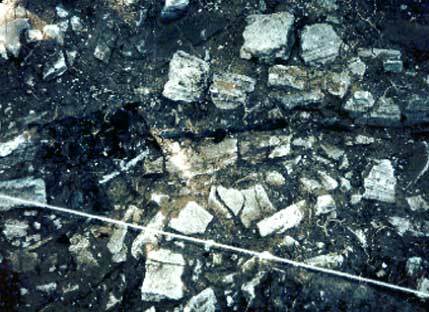 The major visible feature is a large pit-and-ditch system, quarried into the coquina bedrock, but it is unlike other eighteenth-century East Florida indigo works. The ditch system is not shown on the eighteenth-century maps of the settlement and must postdate the 1771 map. The Blanchette site is a unique remnant of indigo production in Smyrnea Settlement but we will not fully understand it without extensive archaeological excavation. In 2009, the county began development of a historical/archaeological park with an intensive survey by Southeastern Archaeological Research, Inc. Twelve eighteenth-century structural areas have been identified (Grange et al., 2009). Public interest in 2008 was high in support of a special Founders Day festival involving both New Smyrna and St. Augustine and the featured speaker was historian Dan Schafer. Eighteenth-century New Smyrnea was a large settlement with a wide variety of structures and there is much more research to do. We still have not found the slave quarters and the cemetery, nor have we confirmed the suspected location of the dam and corn mill and many other structures shown on the recently discovered eighteenth-century maps. The New Smyrna Beach archaeology ordinance should be extended to at least some private property but that is currently not an achievable goal. We continue to urge the city to establish a position for a City Archaeologist because volunteers cannot keep up with site destruction. During the last year there has been less need for salvage/rescue excavations at threatened sites on private property and attention has been focused on the analysis of the materials recovered during the two major excavations discussed above. The delay in laboratory processing was due to the urgency of salvage excavation. Dot Moore and other volunteers have been sorting and tabulating the accumulated materials from the White-Fox and the First Colonists’ House sites and the Florida Public Archaeology Network office in St. Augustine has provided the services of a student assistant to help with the laboratory work. In the coming months or years, we will be able to go beyond the simple culture historical aspects of Smyrnea Settlement. For example, field observations and historical documents make it clear that there were architectural differences between the farmer’s houses “in the country” (such as the First Colonists’ House site) and the dwellings in the central “Town” (such as the White-Fox site). Houses in the country were occupied by families and overseers while clerks and other specialists, as well as single settlers, lived in town. Based on the archaeological evidence, the houses in town were painted -- white on the exterior and yellow and red on the interior -- while those in the country were unpainted. The dwelling at the White-Fox site had glass windows, but no window glass was associated with the dwelling at the First Colonists’ House site. As the analysis progresses other aspects of these potential intra-community variations will be explored. The diet of the colonists is another aspect of life in Smyrnea Settlement that is being investigated through the analysis of faunal remains. There are good samples of faunal remains from the White-Fox and First Colonists’ House sites and Arlene Fradkin, of Florida Atlantic University, has begun the zooarchaeological identifications that will provide archaeological data to compare with historical diet data (Griffin 1991: 58-63). While only part way through the study, fish can be reported as the dominant faunal remains in the samples. There is a long list of archaeological survey and excavation projects for the future. The Florida Public Archaeology Network has recently contributed a Ground Penetrating Radar survey at three important sites, including the Blanchette site described above. The eventual excavation of this extensive eighteenth-century indigo works cannot be done by volunteers alone but they will surely be invited to participate. The Dundee maps provide a guide to further survey projects: as only one example among many, the maps illustrate a “Corn Mill”, a water wheel structure astride a dam. The locus has been tentatively identified and awaits serious survey excavation testing for confirmation. The survey work is far from done. The archaeological and historical research and preservation at Smyrnea Settlement has been the result of the work of professional archaeologists and historians and an army of volunteers. Volunteer person-power is a significant option to consider for large data recovery and preservation jobs with no funding or insufficient support. However, there are always potential injury and other liability issues on either public or private property which must be addressed in advance. We also owe a debt of gratitude to the landowners who enthusiastically gave permission to dig holes in their front lawns. The roster of contributors and volunteer workers is far too long to include all of their names here but their efforts have been an outstanding example of archaeology by and for the public and we thank them all for their efforts. 1 The contemporary spelling of the modern Florida city name is “Smyrna.” Eighteenth-century maps and documents refer to “Smyrnia” and “Smyrnea.” “Smyrnea” is the most common spelling. Adams, W R, D Schafer, R Steinbach and P L Weaver 1997 The King’s Road Florida’s First Highway. Historic Property Associates, Inc., St Augustine, FL. On file, Florida Division of Historical Resources, Tallahassee, FL. Austin, R and D Moore 1999 Archaeology of the New Smyrna Colony. 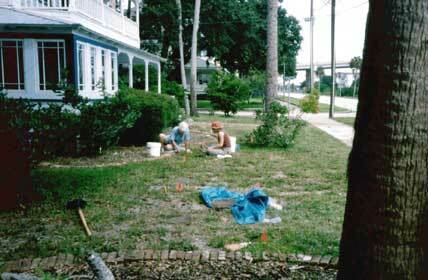 Produced for the City of Port Orange, the City of New Smyrna Beach, and Volusia County by Southeastern Archaeological Research, Inc.
Austin, R J, R T Grange Jr and D L Moore 1999 The Search for Turnbull’s Colony, An Archaeological Survey. Report prepared for The City of Port Orange, The City of New Smyrna Beach, Florida, and Volusia County, Florida by Southeastern Archaeological Research, Inc. On file, Florida Division of Historical Resources, Tallahassee, FL. Doggett, C 1919 Dr. Andrew Turnbull and the New Smyrna Colony of Florida. The Drew Press, Florida. Grange, R T Jr 1997 A Colonial House at New Smyrna Beach. Paper presented at the first Northeast Florida Plantation Symposium, Daytona Beach, FL. Grange, R T Jr 1998 The Turnbull Colonist’s House at New Smyrna Beach. Paper presented at the 50th annual meeting of the Florida Anthropological Society, Gainesville, FL. Grange, R T Jr 1999 The Turnbull Colonist’s House at New Smyrna Beach: A Preliminary Report on 8VO7051. The Florida Anthropologist 52(1-2):73-84. Grange, R T Jr 2001 Structures at the New Smyrna Colony. Paper presented at the second Northeast Florida Plantation Symposium, Daytona Beach, FL. Grange, R T Jr 2007 Settling Smyrnea. British Archaeology May-June 2007, pp. 44-45. Council for British Archaeology, York. Grange, R T Jr, R Austin and D Moore n.d. New Eighteenth-Century Maps of Smyrnea Settlement. Unpublished manuscript in possession of the author, New Smyrna Beach, FL. Grange, R T Jr and D Moore 2002 Search and Rescue Archaeology at the Smyrnea Settlement: A Preliminary Description of Structure Types. The Florida Anthropologist 56(3):221-236. Grange, R T Jr and D Moore 2005 The Archaeology of Stormy Weather at Turnbull’s Smyrnea Settlement. Paper presented at 57th annual meeting of the Florida Anthropological Society, Gainesville, FL. Grange, R T Jr and D Moore 2006 From Nature’s Green to Blue Gold: Indigo Production at Smyrnea Settlement. Paper presented at the 58th annual meeting of the Florida Anthropological Society, Stuart, FL. Grange, R T Jr and D Moore 2007 Smyrnea Settlement Maps and Archaeological Investigations. Unpublished manuscript on file, City of New Smyrna Beach, FL. Grange, R T Jr, D Moore, R J Austin and J Endonino 2009 Archaeological Survey of the Blanchette Homestead and Smyrnea Settlement, Volusia County, Florida. Report prepared for County of Volusia Parks, Recreation and Culture by Southeastern Archaeological Research, Inc. On file, Florida Division of Historical Resources, Tallahassee, FL. Griffin, J W and R H Steinbach 1990 Old Fort Park and Turnbull Canal System Archaeological Survey Project, New Smyrna Beach, Florida. Historic Property Associates, Inc. St. Augustine, FL. On file, Florida Division of Historical Resources, Tallahassee, FL. Griffin, P C 1991 Mullet on the Beach. The Minorcans of Florida 1768-1788. Jacksonville, FL: The St. Augustine Historical Society and University of North Florida Press. Moore, D L and D Ste. Claire 1999 Dreams and Promises Unfulfilled: Andrew Turnbull and the New Smyrna Colony. The Florida Anthropologist 52(1-2):31-46. Panagopoulos, E P 1978 New Smyrna. An Eighteenth Century Greek Odyssey. Brookline, MA: Holy Cross Orthodox Press. Public Records Office n.d. Exact Plan of the River St. Johns in East Florida with part of the Sea Coast. Treasury 77/137, Kew Surrey, England. Rasico, P D 1990 The Minorcans of Florida. Their History, Language and Culture. New Smyrna Beach, FL: Luthers. Schafer, D L 2001 St. Augustine’s British Years 1763-1784. El Scribano Vol. 38 (whole volume). St. Augustine, FL: The St. Augustine Historical Society. Sibley, G 2006 Smyrnea Lost and Found. A Gale Force Films production. New Smyrna Beach, FL; Southeast Volusia Historical Society and Gale Force Films. Southeastern Archaeological Research, Inc. 2005 Archaeological Resources of the Eighteenth Century Smyrnea Settlement of Dr. Andrew Turnbull, Volusia County, Florida. A National Register of Historic Places Multiple Properties Nomination. Prepared for The City of Port Orange, Florida, The City of New Smyrna Beach, Florida, The City of Edgewater, Florida, and Volusia County, Florida. On file, Florida Division of Historical Resources, Tallahassee, FL. Turnbull to Duncan 20 February 1768, Personal communication, Daniel Schafer notes. Original document in City Archives, Dundee, Scotland. Turnbull to Duncan 22 October 1768, Personal communication, Daniel Schafer notes. Original document in City Archives, Dundee, Scotland.